Our "Blues on 78" series continues with this latest gem from El Enmascarado. 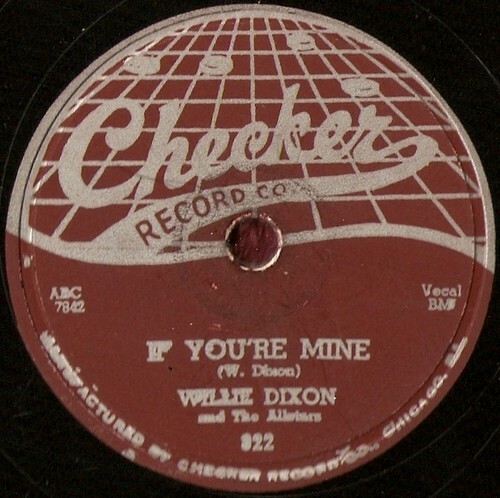 Released in July 1955, this disc was Willie Dixon's first solo disc. "If You're Mine" was recorded in May 1955 with Harold Ashby (tenor sax), Lafayette Leake (piano) and Fred Below (drums). "Walking The Blues" was recorded in June 1955 with Lafeyette Leake (piano) and Fred Below (footsteps). "Walking The Blues" was a cover of the Champion Jack Dupree single on King, which had Mr. Bear doing the walking sounds. Champion Jack's version was the more successful, reaching number seven in the R&B best seller charts, and number six in the most played R&B records on juke boxes at the end of August 1955. 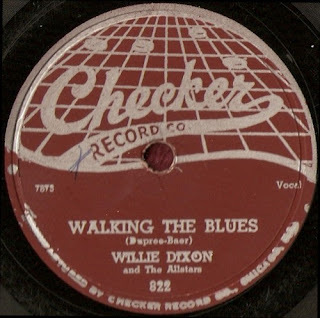 In the same week the Willie Dixon version made it to number nine in the juke box plays chart. Many thanks to El Enmascarado for these rips from the original 78 rpm shellac disc and also for the label scans.